To see how preserved wood is used at your residence, you usually just need to look outside. Preserved wood offers a durable, natural and economic way to add outdoor recreation areas and enhance the look of your landscaping. Preserved wood is an excellent choice for creating outdoor areas that the whole family can enjoy. Wood decks constructed with preservative-treated lumber offers a flexible space for entertaining that can withstand the elements. Gazebos, benches and landscape timbers can turn your yard into an inviting area. Indoors, preserved wood provides protection against potential damage from termites and fungal decay. Treated sill plates provides a barrier to protect untreated wood in the framing of the house structure. Framing treated with borate preservative can be used for indoor areas which may be exposed to dampness. 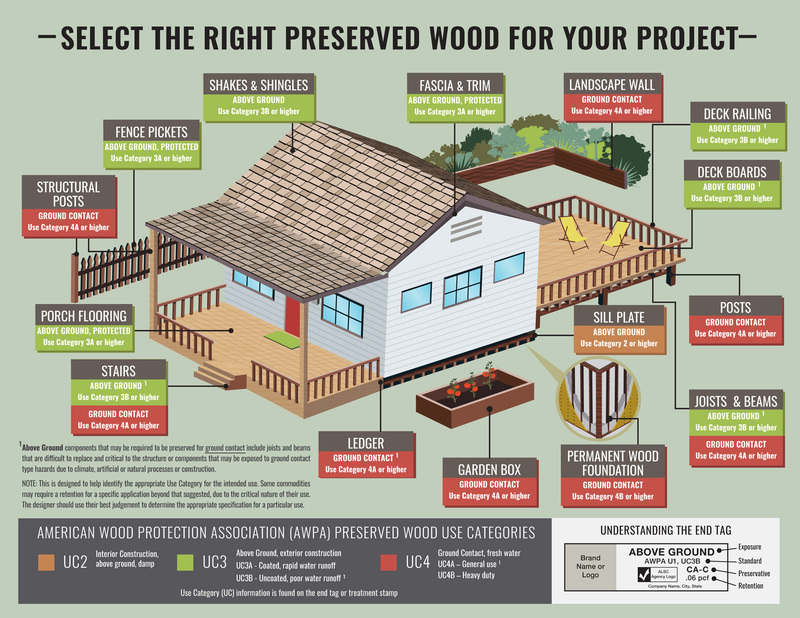 Click on the infographic above to see typical uses of preserved wood around the home. For more information about how preserved wood can be used in specific residential applications below. Outdoor wood decks are perhaps the most popular use of preserved wood in homes. These decks provide a warm, inviting area for relaxing and socializing, yet are rugged enough to withstand for years anything that nature can throw at it. Preserved wood is easy to handle and work with, making it a top choice for professional builders as well as do-it-yourselfers. Ground-contact treated wood, which contains more preservative, should be used in the posts and supporting framing in or in close proximity to the ground. Use the free Deck Span Joist Calculator to determine the proper preserved wood joists to support your deck. Decking boards treated for above ground use are widely available and can be purchased in a variety of sizes, lengths and even colors. The durability of preserved wood products used for building outdoor decks is backed by limited lifetime warranties offered by the preservative manufacturers. See the end tag on the preserved wood product for more information on these warranties. Enhancing outdoors areas with the warm, natural look of wood is easy to accomplish with preserved wood. Unlike composite materials or concrete, preserved wood can be used in building outdoor structures such as gazebos. Wood treated with preservatives is flexible enough for almost any design, yet offers outstanding durability to last for years. Arbors can be constructed from preserved wood which are safe to support flowers or other plantings. Using a series of preserved wood trellises can turn drab walkways into attractive paths offering partial shade. Wood fences built with preserved wood offer a durable, attractive alternative to the sterile look of plastic or chain link fencing. To ensure a long service life, be sure to specify or purchase fencing materials that have been pressure-treated with preservative. While the cost may be slightly more, a lasting in-place performance will be well worth the investment. Posts for fences should be pressure-treated for ground contact. Western species such as Douglas fir and Hem-Fir suited for ground contact will have a pattern of cuts in the wood, called incising (click here for more about incising). These incisions in the wood allow the preservative to penetrate deeply into the wood fiber for added protection. Make sure fence rails are also preserved wood. That will keep fungal decay and termites at bay and allow the fence to endure any weather condition. A yard can say a lot about the family that lives at that property. Utilizing preserved wood in your landscaping can add to your palette in creating an engaging picture of your home. Preserved wood landscape timbers can serve as a pleasant frame for grass, bark, gravel or floral plantings. Stacked together, the enduring wood can provide multiple levels in a yard or even a place to escape the pressures of everday life. It's critical to use pressure-treated timbers in landscaping for the longest service life. There are some wood products sold for landscaping, but have none of the protective qualities of preserved wood. These products fall apart in just a few years, while properly treated preserved wood can last for decades. Since more than 90 percent of American homes are constructed from wood, it's important to protect the untreated framing from the threats posed by moisture or termites. Building codes require that borate-treated sill plates be placed between concrete foundations and the wood framing. This is necessary because moisture moves from the concrete as it dries after weeks, months, even years after it is in place. That moisture can allow fungal decay to get a foothold in wood and break down the fiber. Sill plates treated with borate effectively shield the untreated wood above and block fungal decay and insects such as termites from impacting the interior framing. Inorganic boron is a safe, natural element that has good protective properties. While soluble in water, it provides effective and economic protection for the wood in uses where there is only periodic exposure to dampness. While most preserved wood products are designed for outdoor use, there are some indoor applications where preserved wood is uniquely suited. Subfloors where protection against termites can be constructed from preserved lumber and plywood. Preserved wood can also be used in the floors and framing for areas like bathrooms or laundry rooms, where there is greater potential for moisture that can attract decay fungi and termites. Wood preserved with waterborne preservatives is safe and will not off-gas or leach into living areas. Most treatments for interior uses contain borate, which is also used in consumer products such as soap and eye drops. Wood treated with oil-type preservatives, such as creosote, are not recommended for indoor use as they may carry an odor from the petroleum used in treating.